Located in the Lesser Antilles and surrounded by temperate Caribbean waters, the island of Barbados is world famous for its tropical locale, year-round balmy temperatures, exquisite beaches and exciting nightlife. With such a unique offer for tourists, flights to Barbados from the main UK airports are becoming increasingly popular. But before planning such a holiday, it is important to become familiar with some of the main attractions this island has to offer. These sights and experiences are as diverse as the tourists themselves, but let us endeavour to name a few of the most interesting destinations. 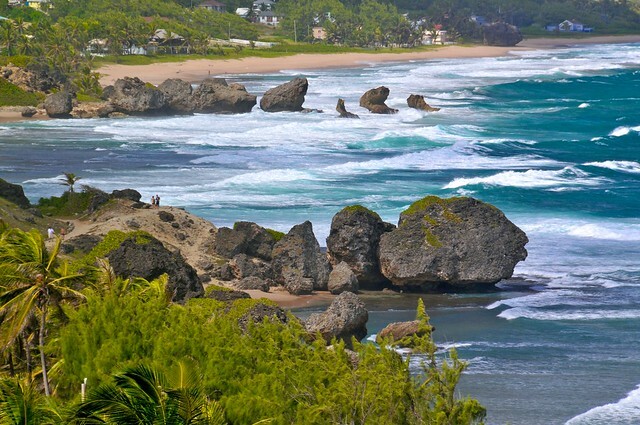 Of all the beaches on Barbados, this beach is said to be the most famous. While the golden sands and numerous local accommodations offer the weary traveller some much needed rest and relaxation, the seafront here is widely known for its waves which can attract some of the greatest surfers in the world. Although not recommended for the novice, one does not have to be an experienced surfer to appreciate not only the panoramic beauty but also the professional surfers riding atop the blue crests, even in inclement weather. This local event is one of the most well-known in all of Barbados. While there exist numerous opportunities to experience top-tier dining on the island, many choose Oistins Fish Fry due to its informal atmosphere. Succulent odours of fish and barbecued chicken waft through the balmy evening air intermingling with the colourful sights and sounds of the local street fairs. Traditional reggae permeates is punctuated with the liberal dispensation of sweet rum. With ample portions, agreeable prices and local hospitality, this event is highly recommended. This phenomenon of nature can only be described as unforgettable. This cave is located in the town of St. Lucy and is the only accessible sea cave on the island. Flower Cave tends to be less frequented than other inland caves and for this reason many choose to spend a few hours here in the relative peace and tranquillity that it offers. One can swim in natural rock pools which are located within or simply bring a packed lunch and marvel at what are said to be some of the most magnificent views in all of Barbados. These are three examples out of what prove to be countless attractions and scenic getaways which abound in Barbados. What is more important is that these listed destinations lie within a very short distance from hotels and other local accommodations. Considering all the attractions contained on this tiny island, it is of little surprise that thousands flock to Barbados each year, promising to return in the future.